I started hunting 15 years ago with my father. Back then, I knew nothing about the best hunting binoculars. I didn’t even have one! Several years later, I got one and started seeing the benefits of owning a pair, and then got another for my hunting activities. It was a changemaker that gave serious boost to my pursuit. Now, I can scout my prey from a very big distance. It would be impossible to do so without the binoculars. In addition, my binoculars do outperform the rifle scope! Most importantly, binoculars help you identify the right prey. Hunting accidents happen more often than you think. A good pair of binoculars minimizes the risks of shooting anything else except your target. I want to share my experience in choosing the best binoculars for hunting. It is very important to know the device in detail. You must know how it works so that you can choose the best model that suits your needs. Let’s meet the basics of good hunting binoculars. How does a hunting binocular work? How did we pick the best binoculars for hunting? 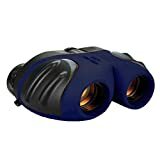 Hunting binocular is a vision device designed to give you a crisp image of the horizon and clearly see your target/prey. Binoculars are essential for successful hunting. The importance of binoculars comes immediately after the importance of your weapon. This device helps you identify your target and look for the pray comfortably with both eyes. You must learn more about binoculars in general. Specifically, you should learn about the basics and properties of binoculars, i.e. how they work. Similarly, you must know parts of binoculars and the importance of each technical feature for effortless use when hunting. Last but not least, you must choose the device that suits your needs. Therefore, let’s start with our short guide on the technology behind binoculars for hunting. As most of the vision devices do, hunting binoculars use a magnification lens. This is the essence of each binocular. The lens is responsible for the magnification. Also, each ocular has a prism. The role of the prism is to show the image in the correct direction. A similar process is going on in the system of a human eye. If there was no prism, you would be seeing an upside-down, backward image! In order to understand the principle behind the hunting binoculars better, we must tell you something about the two basic types of hunting binocular design. Those are the roof prism models and the Porro prism models. The roof prisms design usually leads to a more powerful binocular. The oculars are placed close to each other. As a result, the image is stable. However, this system does have its drawbacks. These binoculars are not very adjustable and it takes skills to keep the image steady. The Porro prism binoculars were the prevalent system until the 1960s. This is when the roof prisms were invented. The Porro system is good for image stabilization. They are usually larger. There is a larger hinge between the oculars. Also, you can make more adjustments. These binoculars are very comfortable. On the other hand, their greatest disadvantage is the fact that the lenses are less powerful than those of the roof prism binoculars. As a result, you can easily get a steady view. When these two model types are compared, we can’t help but notice that the roof prism technology requires a more complex inside structure and more precision during the manufacturing process. As a result, these models are more expensive. Porro prism design is invincible when it comes to budget models, while roof prism models are the best if you are looking for superb, impeccable performance. As we want to help you understand the principles behind the hunting binoculars in order to prepare yourself for your hunting binoculars shopping adventure, we consulted the top experts in this field. Also, we talked with our colleagues from the hunting societies and organizations. Their valuable pieces of advice led us through our research. We had first set the value grid, i.e. the considerations and criteria that helped us prepare this list of choices. 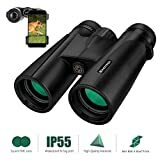 It includes the hunting area the binoculars are suitable for, the device portability, size and weight, lens quality, and, consequently, image quality. Furthermore, we took magnification, waterproof and fog proof features, as well as RBI and FOV into consideration. Exit pupils, prism and focusing were other important elements we examined. Last but not least, stability, comfort, and warranty helped us decide on the winner and the runners-up. Then, we spent a lot of time on web research. We narrowed down our choices and then enjoyed testing the shortlisted products. It is important to point out that we made sure that none of the products had factory deficits or manufacture errors prior to the testing. We heavily relied on community-based usage. Some users contacted us and shared their experiences from the time when the Porro design was the only one available in the market! These senior hunters provided delightful insights into the differences between the Porro and roof prism models. Finally, we wanted to select ten best hunting binoculars so that you can easily pick the most suitable model. Before we show you the results of our research, let’s analyze some of the most important things to consider when buying the hunting binocular. There are several factors important for choosing the proper hunting binoculars. We can’t say with certainty that there is one best model in the market. For the reason that there are different types of hunting, different prey sizes, environments, etc., you will have to find your perfect model. However, there are some common terms and guidelines you should become familiar to. Let’s get started! As you probably already know, hunting binoculars require magnification from 7x to 12x. However, there is an enormous difference between 7x and 12x itself. Some environments require even 14 or up to 19x! How to choose the right magnification? This question is not easy to answer. In order to properly pick the magnification, you should first determine the type of environment you will use them at. Remember that wooded areas imply that your target is close to you. You also have less light. On the contrary, open areas imply that your prey will be far away. On the other hand, there is enough natural light. Long story short, the key differences between hunting in the woods and on an open area include the vision limitation and the amount of light which significantly differs in these two types of environments. In the woods, your vision is limited to approximately 100 yards. Therefore, choosing a 7x or 8x magnification device is the best decision. On the contrary, open spaces, such as fields, require more magnification. Anything between 10x and 12x will be great. If you are hunting in completely open fields, make sure to get a device which supports tripod mounting. This is very important as you will want to keep your binoculars steady. Similarly, always remember that open areas require more zoom. More zoom means image instability. In order to shoot your prey, such as a deer, you will need a tripod. As we have already said if you plan to use your binoculars in an open area, opt for a model that can be mounted on a tripod. Therefore, binoculars with magnification more than 10x are the best binoculars for deer hunting. Don’t bother with the device weight, as you will anyway have to mount it to a tripod. You will need some time to spot prey that moves quickly. The same rules go for best binoculars for elk hunting. Last but not least, you might want to use your binoculars in different types of environments. If that is the case, what is the solution? Most experts and experienced users say that 10x magnification is the best choice in these cases. 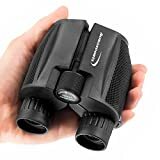 This magnification, together with a good lens diameter of 42 mm, provides excellent predispositions for comfortable use of your binoculars both in an open area and in a wooded zone. When choosing your hunting binoculars, weight directly affects its portability. Similarly, size matters. Remember that your equipment should be as light as possible, as hours of hunting may become overwhelming. Size and portability are especially important features of the best binoculars for bowhunting. You will have to make quick moves and use the binoculars with one hand. Finally, these are the reasons why large and heavy binoculars are not a good choice. It is true that the devices with magnification higher than 10x will be somewhat heavier. This is why you must evaluate your needs. If you don’t need such a strong magnification, don’t choose it. It will do more harm than good. Remember that high magnification means extreme image shaking. Last but not least, don’t forget that every ounce matters when you go hunting. Image brightness is extremely important for hunting. How to obtain the best possible image brightness? You should know that the exit pupil is one of the key factors in the image brightness. As we will define it in one of the following sections, the exit pupil is actually the measure of the diameter of the light beam that comes out of the eyepiece. Interestingly, if you divide the value of the lens diameter by the value of magnification, you will get the value of the exit pupil! For example, if you have a binocular with 8x magnification and 42-mm lens diameter, dividing 42 by 8 gives us the exit pupil value that equals 5.25mm. However, what does a narrower or wider exit pupil actually mean? The narrower value means that the image falls on a smaller area of your retinas. As a result, the image seems dimmer. This means that you want a wider exit pupil for better results. Simply put, if you use the same lenses, but increase the magnification, you will decrease the image brightness. This is why it is very important to choose the magnification/lens diameter ratio wisely. Lens coatings play a very important role in minimizing negative effects from the environment and thus reinforcing the image quality. First of all, lens coatings minimize the amount of reflected light. As a result, the amount of light that enters the optical system is maximized. Let’s get familiar with some useful terms related to lens coatings. First of all, coated optics are usually cheaper than fully coated optics. They provide a single-layer anti-reflective coating. Secondly, term fully coated optics refers to a coating applied to all air-to-glass surfaces. Each surface is coated with a single anti-reflective layer. Next, the multi-coated optics. This is the most common type. It is more expensive than the first two types we described. Multi-coated lenses imply multi-layer anti-reflective coating on one or more surfaces. Finally, there are the fully multi-coated lenses. This type of binoculars is the most expensive, but also provides the very best anti-reflective protection. All air-to-glass surfaces are coated with several layers of the anti-reflective coatings. Except for the anti-reflective coatings, which are a must, there are other types of coatings as well. Those include a phase correction coating, which enables a sharper image; metallic mirror coating, which leads to a brighter image, or the water-repellent coating. Last but not least, you should choose a device with the anti-scratch coating as well. Magnification is the most important thing you have to consider when buying your hunting binoculars. First of all, how can you easily identify the magnification value? It is always designated with an “x”. For example, if your device says “8x”, this means that it can magnify an object eight times. In other words, let’s imagine you are observing a bird from 800 meters away. If you use binoculars with 8x magnification, the bird will appear as if it was only 100 meters away! In addition, don’t forget that you get the effect of “tunnel vision” with high magnification. This means that your awareness will be narrowed down to a limited area if you use higher magnification. Similarly, magnification affects the field of view, but we will focus on this topic a bit later. This is another important factor, as it determines the amount of light that enters the binoculars. Simply put, the bigger the objective lens size, the better for the low light environment. How will you quickly recognize the objective lens size value? Look for it after the mark of the magnification. It is always stated immediately after the “x” mark. Waterproofing is very important, especially for hunting in humid conditions. Even if you think that you don’t need waterproofing, we assure you that your binoculars will have to face water at least once during their lifetime. And once is enough to ruin them if they don’t have waterproof coatings and features. You will be using your device outdoors. Therefore, waterproofing is one of the most important features of a good hunting binocular. We recommend the O-ring seal and additional coatings. Superb waterproofing solutions enable flawless device performance even after hours spent in water! Rubber coating is also a very good choice. It provides not only waterproofing but also a shock-absorbent feature to your device. Similarly, fog-proofing is very important. Temperature and humidity differences may cause fogging. This is a very annoying problem when hunting. Make sure you choose a device with anti-fog protection. Simply put, eye relief denotes the distance between your eyes and the ocular lenses. As a result, this enables or disables using the particular binocular if you wear glasses. Long range 17mm and above. Eye relief is also important for those who are used to wearing sunglasses when hunting. Also, advanced models have extendable and adjustable eyepieces. Field of view is, simply put, the measure of the area you can see with your binoculars. It is expressed in degrees. Basically, the larger the FOV degree, the larger the area. Therefore, the larger the degree, the better. There is a correlation between the binocular power and the field of view. Remember this rule: higher power means narrower FOV. Let’s consider this simple representation, to get a better mental image of the FOV codependency from other factors. For example, if you use 8x magnification instead of 10x magnification, you get 20% wider FOV. The Relative Brightness Index shows the performance of your binocular in an environment with poor light. There is a tight relation between the exit pupil and the RBI. If you take the square of the exit pupil value, you will get the RBI. For example, if the exit pupil value equals 4.5, the RBI value equals 20.25. How to choose the RBI value? If you stick to at least 20 RBI, you will get the best hunting binocular. As we had already mentioned before, the exit pupil value shows the ratio between the lens diameter and binocular magnification. In general, a 7-mm exit pupil allows maximum light intake and is therefore considered to be the optimum choice for a dark environment. Simply put, the larger the exit pupil, the more light absorbed by the binoculars. Hence, you will get a brighter image. Therefore, you don’t have to buy a device with a large exit pupil value if you know that you will be hunting in an environment with a lot of natural light. Actually, choosing a smaller exit pupil value is a wise decision in this case. Your binoculars will collect less light. As a result, the image will be clearer. Here’s another pro tip for you: don’t choose lenses with less than 30-mm diameter. The chances that you won’t be able to see any details are high. Collimation actually means optical alignment. What does optical alignment mean? If the lens optical axis is well-aligned with high precision, we say that the binoculars are well-collimated, i.e. optically well-aligned. Collimation directly affects the binoculars performance. As aligning the optics is not easy, special equipment, which is very expensive, is used during the collimation process. Therefore, one of the signs that your binocular is well-collimated is – higher price. There are two types of focus: the independent focus and the central focusing system. Both have advantages and disadvantages. Let’s take a look at their pros and cons. The independent focus allows you to arrange and adjust each eyepiece separately, i.e. independently. You should choose this type of binoculars if you are going to use them for heavy field use. On the other hand, the central focusing system allows adjusting both tubes simultaneously by rotating the central focusing wheel. This saves your time, energy, and effort. The good thing is, you can additionally adjust one of the two eyepieces for better results. Finally, we must say that most experts recommend choosing binoculars with the central focus for hunting purposes. Prisms are another important element of hunting binocular. What is the role of the prisms? They allow viewing the image correctly, in the right way. Today, BaK-4 glass is considered the best for prisms. It is superior to the BaK-7 type. Similarly, you need to be able to differentiate between the roof and Porro prisms. We already talked about the key differences between these two types. Today, roof prisms are more popular, as they are more portable and compact. However, we must not underestimate the affordability of Porro prisms and their exceptional image quality. When hunting, stability, and comfort of your device play a very important role in obtaining impeccable results. You will use the binoculars for many hours and you want a safe grip, non-slip material, and ergonomic design. Alike the budget, warranty matters. Binoculars are usually not very cheap and investing in this piece of vision equipment should be reinforced with a good warranty. Some manufacturers offer 2-5 years of warranty. Others provide a limited lifetime warranty, but you can even find excellent models with VIP, unlimited lifetime warranty. When choosing your binoculars, one of your goals should be the optimum price/quality ratio. It is important to invest in a good pair of binoculars, as this will directly affect your hunting performance. It is interesting to point out that, according to the experts, a good binocular can imply up to 60% better hunting results! Even though price does usually show quality, don’t forget that the most expensive device does not always imply the highest quality. You can find amazing binoculars at affordable prices too. There is a fine nuance between quality and price which is artificially increased due to a posh feature or attractive design that does not affect your performance. We have categorized our top picks according to the type they belong to. Some of the models have the roof prism system, others are based on the Porro prisms. Similarly, we chose the best models according to their suitability for different categories, such as adults, the best budget model, etc. After analyzing their basic factors, such as magnification, lens diameter, image quality, waterproofing, stability, etc., we composed this review in order to help you find the specific product you need. Let’s get started! Our expert team chose the Bushnell H2O Waterproof/Fog proof Roof Prism Binocular as the overall best hunting binocular model. The reasons are many. Let’s start. First of all, Bushnell is the leader in the hunting binocular industry for more than 65 years. Their core values include the highest quality, excellent optics, and reliability. One of the strongest assets of this model is the multi-coated optics. As a result, this binocular has the extraordinary light transmission ability. In addition, image brightness is impeccable. When it comes to prisms, this model has the BaK-4 prisms. As a result, the image is bright and stunningly clear. This Bushnell waterproof and fog-proof prism binocular has 10x magnification. In addition, it has a 42-mm objective diameter and a 12-foot close focus distance. This model has both front and back lens covers. Furthermore, we appreciate the fact that this binocular is both fog and waterproof. The device has the O-ring seal protection. In addition, it is nitrogen-purged. The greatest advantage of this particular model is its 100% waterproof feature. You can literally immerse it into the water and the device will not be damaged. Similarly, even rapid, sudden, and drastic temperature and humidity changes won’t cause fog. Furthermore, these binoculars are shock-proof. They are equipped with a non-slip rubber armor. The soft touch texture of this element is responsible for absorbing shock. At the same time, it provides a firm grip, so you can safely handle your binocular. They eyecups are a twist-up model. There is a long eye relief for extra comfortable use. It measures 17 mm. This is a highly adjustable device. It has large focus knobs. You can quickly operate them. The binocular measures 7 x 6 x 3 inches. It weighs 1.56 lbs. In addition, this model comes with a comfortable strap and a case. This model has 305/102 feet@1000yds/m@1000m field of view. Last but not least, we must mention aesthetically pleasing design. Our team of experts loved the appearance, touch, and feel of these hunting binoculars. The device comes with a limited lifetime warranty. These binoculars don’t come with the tripod mountable part or the base clip. The crisp, HD image quality combined with impeccable, 100% waterproofing and fog-proof feature of these binoculars make this exceptional product stand out. 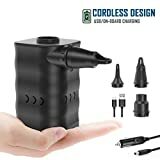 This is why we chose this device as the top of the list. You should pick this binocular for hunting, due to excellent magnification, image clarity, and durability. The Falcon series by Bushnell is famous for decent magnification and specifications at very affordable prices. This model is not the exception. Versatility is one of its strongest assets. This binocular is a very good choice for hunting, stadium sports, bird-watching, etc. It is a very durable device with some peculiar features rarely found even in more expensive devices. The key peculiarity of the Bushnell Falcon 133410 binoculars is the InstaFocus technology. This system enables you to focus on moving targets easily and in no time. This feature is not found often in binoculars and, at the same time, it is very useful for hunters. Furthermore, we want to point out that this model is very affordable. It is our best budget binoculars pick. 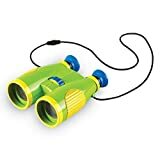 We can say that these are rather cheap hunting binoculars. However, this is not a “cheap” model in terms of its features. Namely, this device has fully coated optics. As a result, it provides excellent light transmission. In addition, the device has an integrated auto-focus Porro prism. In combination with a satisfactory 7x magnification, this is a decent hunting binocular. Lens diameter measures 35 mm. It has a 20-feet close focusing distance. It has a 420-ft. FOV at 1000 yards. It has a 12-mm eye relief and 5-mm exit pupil. You can safely maneuver this device, as it has a non-slip rubber grip pad. It has a convenient fold-down eyecups. This is excellent for people wearing prescription glasses and sunglasses while hunting. It protects them from scratching. This model comes with a quality strap and a good case. It also comes with a tripod bush. 420-foot field of view at 1,000 yards. Excellent specifications and value for the price. This device comes with a tripod bush, a case, and a neck strap. Very good field of view. Users state that this model is not the best for mid-distance viewing. Finally, we can say that these are the very best cheap hunting binoculars in the market! Their features are also very good. Namely, the Porro prism and fully coated lenses are responsible for crisp imaging. These binoculars are suitable for hunters wearing eyeglasses or sunglasses. In addition, the device has the InstaFocus smart, quick focus system rarely seen in other similar devices. We started this review with some amazing Bushnell models and here comes another one. Bushnell really dominates this section of binoculars and Bushnell Legend Ultra HD Roof Prism Binocular model is not the exception. The strongest asset of this Bushnell model is the ED Prime Glass. It plays the key role in exceptional optics of this device. This type of low dispersion glass accounts for amazing color detail, i.e. excellent color resolution. Secondly, it is responsible for the perfect contrast. It eliminates chromatic aberration. Therefore, it is very good for low-light conditions as well. The ED Prime Glass is reinforced with ultra-wideband coatings for even better results. Another feature we loved about these binoculars is the anti-reflection coating. As a result, the maximum amount of light from the front glass penetrates the optic system of the device, all the way to the eyepiece. Hence, the device enables excellent brightness and true colors. This device has a very good magnification. The 10x magnification is combined with 42-mm aperture. This is considered the golden measure for hunting binoculars. Therefore, you will definitely be satisfied with the output. In addition, the device provides extra-wide FOV. It measures 340/113. It also has a very long eye-relief, measuring 17.2 mm. Another peculiarity of this model is the PC-3 phase coating of the prisms responsible for enhanced resolution and contrast. Furthermore, another lens coating increases the performance of this device. Namely, we are talking about the RainGuard HD water-repellent coating. Therefore, this is a waterproof device. Similarly, it is fog-proof. You can safely use it in environments with different temperature and humidity, without fear of fog. It has twist-up eyecups. It can be adapted to a tripod. Let’s talk about the design and exterior of this interesting model. It has an advanced chassis, compared to other similar devices. It is made from magnesium. Therefore, this is a lightweight device. It weighs only 1.54 lbs. It measures 5.28 x 4.02 x 6.89 inches. It is also rich in accessories. The device comes with a soft case, a microfiber pouch, and a neck strap. This device has lead-free glass. It has advanced technologies, such as the ED Prime Glass and special coatings. 100% waterproof and fog-proof model. The device is made in China, which is a disadvantage according to some users. Some users report that it is difficult to connect the strap to the binocular. This device has the golden balance regarding the magnification and lens diameter, combining 10x magnification and 42-mm aperture. The output is a clear and crisp image. Excellent eye relief measuring 17.2 mm makes this model suitable for hunters with glasses. In addition, experts appreciate advanced systems, such as the ED Prime Glass and anti-reflection coatings. When it comes to hunting binoculars, compact size and form are very important factors for successful hunting. Large and heavy binoculars won’t help, especially if you have to catch a highly movable prey. Therefore, Bushnell Powerview Compact Folding Roof Prism Binocular is the best choice for those who value ultra-compact design. In addition, the manufacturer enriched this model with non-slip armor made from rubber. It has two roles: absorbing shock and providing an ultra-safe grip. In general, these binoculars are fashionable and have a contemporary design. When it comes to optics, the feature especially appreciated by the users and the experts are the fully coated optics. This results in a brighter view. 8x magnification is suitable for hunting. The lens diameter is somewhat smaller than that of other similar devices. It measures 21 mm. With fold-down eyecups, the device has a central focus system. The roof prism technology itself dictates some of the features. One of them is the price range of this model. Furthermore, the prism glass type is the BK-7. They come with a neck strap and a carrying case. 8x magnification is suitable for hunting. It can be shipped only to the USA. These binoculars are not water/fog proof. This model cannot be adapted to a tripod. These are the very best binoculars if you are looking for a compact design. The form and size are perfectly determined by experienced Bushnell hunting binoculars designers. In addition, this model has an 8x magnification and fully coated lens, which provides very good imaging. The key peculiarity of this model by SkyGenius is its power. This is definitely one of the most powerful models of hunting binoculars in the market. Its size, performance, and required skills clearly indicate that this model is suitable for adults. 10x magnification is combined with 50 mm lens diameter. 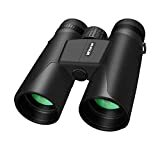 These binoculars are suitable for different kinds of environments, both open and deep forests, as they function perfectly even in conditions with low light. The very clear image is obtained through a multiple layer coated lens. The lens ensures minimal distortion. Contrast, colors, brightness, detail, and overall image quality are excellent. Another thing we liked when we were testing this product is the touch and feel. It is a very solid, comfortable device. It is durable and shock-resistant. Rubber finish enables safe maneuvering. The central adjustment system ensures quick and easy use. Each eyepiece can be calibrated separately. This enables extra-clear view. Furthermore, the peculiarity of this model is the use of the unique corrective optical coating. It is responsible for allowing excellent light transmission. In addition, this feature provides color fidelity. Large FOV allows wide images and superb tunnel vision experience. The binoculars come with a bag, a strap, a gentle cleaning cloth, and lens caps. They weight 1.75 lbs. The wide image allows extra-comfortable prey following. Very good magnification and lens diameter balance. The central adjustment system enables effortless use. The objective lens has no coating. The model is not suitable for hunters with glasses. The key features of this model by SkyGenius include large FOV which is perfect for following prey that moves quickly. Furthermore, it is easy to use due to the comfortable central wheel. This is one of the best models for adult, experienced hunters. It is also good for bird watching, nature observation, and sports and games. This model combines 10x magnification, suitable both for wooded and open areas, with a 28-mm objective lens diameter. These features provide excellent optical quality. In addition, its multi-coated lenses ensure image brightness as they transmit more light. The strongest asset of this binocular is one of the largest fields of view in the market. You will enjoy the comfort of hunting with these binoculars. Field of view measures 273 feet/1000 yards. The angle equals 5.1 degrees. Another strong asset of this model is its durability. Sleek design, rubber armor, non-slip grip, and short-hinge structure ensure comfortable use. That’s not all! This device is waterproof and fog-proof. It is suitable even in extreme weather conditions and different environments. The device has argon-purging protection. Eyecups are adjustable. The system is a twist-up. Eye relief is also adjustable. Normally, it measures 16 mm. Close focus equals 6.5 feet. Last but not least, let’s say that this model had set one of the standards when it comes to price vs. performance of hunting binoculars. The model comes in a semi-hard neoprene foam case. Also, you will get a comfortable neck strap. Excellent FOV and angular FOV. Very good image quality and overall performance. Excellent price to performance standard. Multi-coated lenses for image brightness. This is a very efficient hunting binocular model. It has a high-performance optical system. Its enhanced, multi-coated lenses provide very well, bright images. The device is very good in the low-light environment too. Most noteworthy, the ultra-wide FOV of these binoculars makes it stand out as one of the best binoculars in the market regarding this feature. This model has 10x magnification and 55-mm lens diameter. This gives it a very good, 5-mm exit pupil value. Such features ensure excellent image quality and brightness. The eye relief measures 9 mm. It is not the very best eye relief in the market, but it is definitely satisfactory. The device can be used by hunters with glasses. Smart, fold-down eyecups also protect the lenses from scratches made by glasses. The binoculars have a 25-ft. close focusing system. The Porro prism design provides stable imaging. In addition, fully coated lenses enable very sharp results. The auto-focus system saves your time and effort. The InstaFocus feature enables fast focus, especially suitable for targets that move very fast. This model is abrasion and scratch-resistant. The rubber coating ensures a safe grip. The device comes in a durable case, with a comfortable strap, lens cleaning cloth, and lens caps. 3 x 8.2 x 4.2 inches. The device comes with lots of accessories. When we were testing this device, we liked its responsiveness. It has the auto-focus system reinforced with the InstaFocus technology. This saves your time and effort when focusing a prey that moves very fast. As a result, your hunting results are superb. Finally, 10x magnification and 55-mm lens diameter provide bright, quality imaging. This model has a decent, 8x magnification. It is good for hunting in wooded areas. The magnification is combined with a 32-mm lens diameter. Field of view measures 392 feet at 1,000 yds. The eye relief is extra-large. It measures the unbelievable 19.5 mm! Twist-down eyecups additionally reinforce this amazing feature. Therefore, Carson 3D Series High Definition Waterproof Binoculars are the perfect choice for hunters wearing glasses. The device has the superior BAK–4 prism glass. It weighs only 1.2 lbs. Therefore, it is suitable even for beginners. It will not represent a burden at any moment, even after hours of hunting. The device measures 5 x 2 x 5 inches. One of the strongest assets of this model is the ED glass. It results in a sharp and bright image. It also reduces color fringing. Furthermore, this is a waterproof and fog-proof device. This excellent model has the O-ring seal and is nitrogen-purged. The lenses are multi-coated. It comes with lots of accessories. You will get a comfortable neck strap, shoulder harness, lens cloth, and covers, as well as a durable, deluxe case. In addition, we loved the touch and feel of this model. Its rubber armor provides a very good grip. Ergonomic design allows simple use. This is especially true for very nicely positioned thumb grooves. At the same time, this is a sturdy model. It is durable and shock-proof. It has a tough construction. The device can be mounted to a tripod. However, the tripod and the adapter are not included in the package. The long eye relief in the market for extra comfort. Suitable for hunters with glasses. ED glass and multi-coated lenses for superb performance. This model doesn’t come with a tripod adapter. If you are looking for a model suitable for wooded areas, lightweight, and durable hunting device, Carson 3D Series High Definition Waterproof Binoculars are a perfect choice. This model is equipped with top-notch features, such as the BAK-4 prism glass, ED glass, multi-coated lens, O-ring seal, etc. Overall, it is a very good hunting binocular. This binocular is based on the roof prism system. It is a full-size model with 10x magnification. This excellent magnification is enhanced with a 42-mm lens diameter. As you already know from this review, it is the best combination for hunting binoculars. Field of view equals 345 feet/1000 yards. The angle measures 6.6 degrees. One of the peculiarities of this model is the VIP lifetime warranty. It is an unconditional warranty which includes all kinds of repairs! Getting this type of warranty is really rare for this kind of devices. In addition, we loved the fact that the lenses have multi-coating. They are both waterproof and fog-proof. This model has the O-ring sealing. Furthermore, it is argon-purged. Therefore, it has a 100% weatherproofing. The device comes with a comfortable neck-strap. It also comes with lens covers, a rain guard, and a deluxe case. 100% waterproofing makes it suitable for different environments and weather conditions. 10x magnification and 42 mm lens diameter account for excellent image quality. Argon-purged for extra safety against humidity. Good FOV suitable for hunting. Lenses don’t have the full coating layers, i.e. the dust, oil, and fingerprint-repellent coatings are missing. This model is suitable for wet and humid hunting environments. It has several types of coatings that protect the lenses from the water. These include argon protection system and the O-ring sealing. Finally, this model has the very best magnification/lens diameter ratio, i.e. the 10x42 specs. PermaFocus series is well-known for stunning clarity obtained without adjustments that require special skills, time, and effort. The focus-free feature of these binoculars is their key peculiarity. It makes them excellent for instantaneous viewing. In addition, we realized that this feature is useful at any distance! Therefore, these binoculars are not only good for hunting but for observing sports events, wildlife, as well as use during cold, winter days. You don’t have to deal with gloves and focus adjustments anymore! Let’s talk about the key features of any binoculars – the magnification and the lens. 10x magnification is combined with 55 mm lens diameter. These binoculars are based on the Porro prism system. Another advantage of this model is the fact that the optics are fully coated. As a result, you get a bright and crisp image. Furthermore, this model is carefully designed for extra safety and easy maneuvering. It has the non-slip rubber armor. It acts as shock-absorbent and provides a firm grip. This device belongs to a mid-size class. It has twist-up eyecups. Extra-safe grip allowed by the non-slip armor. Very good magnification for superb prey identification. The focus-free system allows easy use. These binoculars are not waterproof. They can be shipped only within the USA. These Porro prism binoculars by Bushnell are unique for its PermaFocus system and wide-angle view field. They’re easy to use, have a comfortable and safe grip and fully coated optics. Hunters choose it because of the focus-free, effortless use. In addition, we chose it as one of the top-rated hunting binoculars due to its very good magnification of 10x. If you are a passionate hunter, we are sure that you do take care of your weapon and equipment. Your weapon needs cleaning and care after each hunting session, especially during the hunting season. Similarly, the optics of your binoculars can become dirty. The dirt can come from the environment – forest, leaves, bugs and insects, soil, or even your hands. Always read the User’s Manual provided by the manufacturer. You will find many useful rules and tips there. Use a moist cloth to clean the rims, focus wheels, and the barrels. Don’t exhale air onto the lenses when trying to clean them. Get a special lens cleaning cloth made from microfiber. Dampen the cloth with water. If you can use a solution made especially for the optics, that’s great. Gently rub the lens in a circular motion. Always use the lens caps when your binoculars are not in use. Always use the protective case when you are not using the binoculars. Finally, we believe we provided a detailed and comprehensive guide on getting to know parts, technologies, and principles behind binoculars for hunting. In addition, we wanted to teach you how to recognize quality models. We picked 10 models of top hunting binoculars in different categories. This hunting binoculars review showcases the best models in different categories. The overall best model is the Bushnell H2O Waterproof/Fog proof Roof Prism Binocular. It has all the features necessary for a safe, advanced, and successful hunting experience. Our experts chose the Bushnell Falcon 133410 binoculars as the best budget binoculars for hunting. They provide excellent value, so we believe these are the best hunting binoculars for the money. Similarly, the Bushnell Powerview Compact Folding Roof Prism Binocular found its place among the top-rated binoculars, due to its compact size and form. In the end, let’s point out that there are many other quality models in the market and that the decision on the most suitable device is yours, depending on your needs and preferences.